Nancy Birdsall and Owen Barder both have fantastic lists of new development ideas, the most radical (and awesome) of which is I think Owen's "global minimum income guarantee backed by cash payments to the world's poorest people." Go and read and revel in the development-policy-beyond-aid awesomeness. Owen also points to the campaign for Aid Transparency website, which although being a great cause, really need to work on their marketing a bit. There is lots of information about consultation papers and TORs and Technical Advisory Groups (TAG) and Steering Committees and Secretariats and Official Statements and OECD-DAC and the OECD DAC's Creditor Reporting System (CRS) and what all of this means for the DAC's Working Party on Statistics (WP-STAT) and HOLD ON A SECOND ISN'T THIS EXACTLY THE KIND OF SUBTERFUGE THAT TRANSPARENCY IS DESIGNED TO OVERCOME!!! OK OK I know project governance is important, but as Owen argued in Beyond Planning, the Paris/Accra agenda is failing because donors have little incentive to do what they say. So how about doing some simple naming and shaming huh? 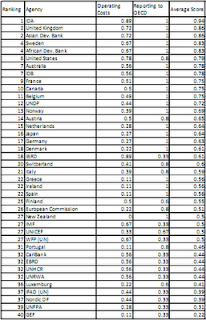 So here is Bill Easterly and Tobias Pfutze's (2008) transparency ranking of aid agencies by their public reporting on their operating costs, and on their reporting to the OECD. GEF (Global Environment Facility), at least in your transparency practices in 2008, you sucked. So did you UNFPA. No gold stickers for you. Bad agency, bad! The Easterly and Pfutze rankings are a stab in the right direction, but they're far from perfect and not what I would necessarily consider ideal indicators of transparency for naming and shaming. They are 50% subjective, based on the amount of time it took for that organisation to respond to Easterly/Pfutze's requests for information (if the information was not on a website). And 50% whether or not the organisation was fully reporting to the OECD DAC. Subjective? Really? What are the good excuses for not publishing some basic operating spending data on a website in this day and age? It's incomplete anyway. Just publishing is not enough. I've seen this in years (in the UK and abroad) of doing performance assessments, including of aid data and its provision. Who reads it is crucial. So publishing on a website might not be of any real use if people within the country don't use the website. A donor that doesn't publish on its website detailed figures but provides detailed figures to the Government who then publish and disseminate analysis in multiple languages is way better than the World Bank, who have everything online and on the Client Connection, but then don't respond to data requests by developing country Governments, depending on the country office in question. Another crucial element is the level of disaggregation that data is provided in: take Unicef. if you just ask for their programme data, they will give you stuff that is so highly aggregated you can't do any useful budgeting or sectoral analysis with it. But if you ask them to disagg, they'll take much longer but provide you with *brilliant* stats for each implementor, each sector, and within each sector, each implentors disbursements. And then WFP - really high level of aggregation, but they tell you exactly what is in-kind, and what is cash, something almost 0 other donors do. and so on - GTZ will tell you how much of their aid is TA (in the broad definition 100%), but virtually no other donors are able to, JICA being an exception. Transparency is incredibly complicated. It's not just about aggregates and publication. What the data can be used for should be the most important criteria for assessment. Agg figures only matter to the donor country electorate who don't want or need more detail, and they're not exactly the best advocates for effectiveness of aid.